With Jesus our ancestor in Middle East could experience a physical manifestation of God through Jesus miracles. Now 2000 years later we are talking about a physical manifestation of God in our brain. MRT were made with Christian believers. Frontal Attention regions, The Nucleus accumbens and the Medial prefrontal cortex. fire burning … a wonderful warm glow it makes you want to do good and be good. Iit may be the emotion that moral psychologist Jonathan Hite refers to as elevation. 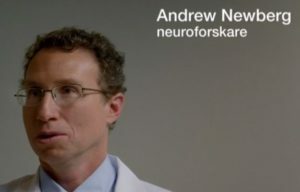 Morgan *Freeman met Andy Newberg a neurotheology neuroscientist in Philadelphia who studies what happens in our brain when we have religious experiences. 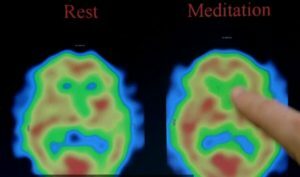 The activity in Morgans frontal lobe increased during meditation just like Nuns being with Gos or Buddhists metidating. A Atheist contemplating at God were not that successful, The Atheist could raise frontal lobe activity only a little. I am personally skeptic in considering the neuro scans to be a proof a divine presence or a God manifestation. 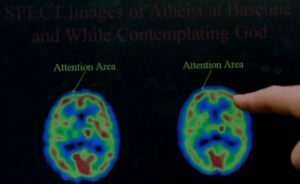 I would rather prefer to say that those MRT scans show the brain reacts on divine belief and divine experiences. But that is just my hypothesis. God has however the power to “play” with Quantum physics rules , like Jesus did once as God is in my belief, the Creator of these. God is therefore able to show up in any kind of incarnations (Avathars) or any other way. You may look at this interview with Andrew where he share his opinion about the “conflict” between religion and “Science”. He makes a good effort to solve that millenial conflict many humans have. To bring peace in this “conflict” has been my effort long time now . My last effort ended up describing a new “theoscientific” Creation view in the “Enlightened Genesis“. i studied thermodynamics many years ago and came to learn about entropy that describes the state of a system, the state of disorder. To make an example, a egg has low entropy (low disorder) If you scramble it, the entropy (disorder) raises. As you know you can not unscramble a egg. Similarly, if you put a piece of ice in a cup of warm juice, the peace of ice (with low entropy) will melt (get higher entropy) . it is unlikely you can reverse that system to get the piece of ice back in your warm juice. I associate a system with high entropy with disorder, chaos. while a system with low entropy is a form of order. Entropy could be defined as a description of the degree of disorder. Chaos and order are not the same word. 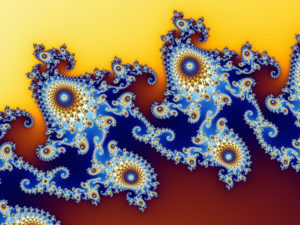 But chaos is normally a system of high entropy. I like to visualize high entropy with chaos even if that is not always correct. E.g. a wood may seem chaotic in our point of view but has really a high state of order. In our Biosphere everything get higher entropy that is, build up chaos with time. All living creatures disrupt with time and finally die. This because the ordered DNA get disrupted during the many replications. Not to forget that the low degree of disorder in ice is created in lack of heat. So water and gases behaves in a different way. Children tend to raise disorder in their living space. It is a sideeffect , we adults (parents most of all) have to live with Their creating disorder leads to a raise of intellectual order in their brain, that is learning. Cleaning up the room is the same as lower the entropy (disorder) of it. other examples of entropy and how to use it in engines. A theological view of the thermodynamics of entropy. God/Allah has created a system (our Universe) that is so well programmed that it, out of a extremely high disorder, by itself builds up order, the order of which we can use for our own survival. Before Salat it (Muslim prayer) is important to clean yourself and the prayer room. That is a form of showing thankfullness to our Creator that gave us life (=order.) God loves life and order. Shaytan (Iblis) on the contrary does not like order (disorder=death, suffering). Where Iblis has taken over, you see very high disorder, destruction and death. I invite you to Look at and meditate over this video. Compare the order good humans created with the help of God, before the war and the disorder after the war. It is very important to remember that we can not say, its the devils fault. We were given a brain with a intelligent reasoning frontal lobe, so we can normally choose whose what whispering we want to listen to. The whispering of the devil or the whispering of God. We have also learned to distuinguish between evil and good. So no excuses for our bad behaviour. I were used to go to church every Sunday. As there are seldom Sunday Masses in the church in this village, I got help from my Muslim neighbor to learn how to pray like a Muslim. Something I can do by myself in my home. These are the five prayers where you can hear the first Surah “Al-Fatihah” being recited. once every raka. I can recite myself Al-Fatiha except the last meaning. I like to do it thinking about the message of the meanings i agree with. The muslims does not sing the Quran. She is a ambitious good believer but I think it would be better if the Bible were “recited” like the Muslims do as I personally have difficulties to hear the Bible texts in her song with all the music and that distracting girl dancing around like a Sufi. The Quran Muslim recitation on the other hand are easily understood. And todays recitations may sound like Angel Gabriel did reciting to Mohammed in the cave over Mekka. I presume that God did not sing the verses e.g. to Moses or to John with background some for the time modern music (not pop of course). This salat is done very early. I can not manage to do it if I don’t happen to wake up myself the night. I did it once when I woke up at 3 am and after taht Salat I slept very well. With my stroke related mental fatigue. I avoid to interrupt my night sleep with a alarm clock. Whe nI am not together with a Muslim I do it myself looking at these videos. I recite what I am able to otherwise do I listen and read the prayer texts. I alway wash my self and my room as I want to show order to Allah, something Allah has give humanity. But when I am alone I don’t cover my knees as I see no reason to do it as Allah sees everything anyway. Christians and Muslims worship the same God. I feel good to make Muslim prayer. Heard by Allah those “who praise Him”. the angel who records your good deeds is to this side. The angel who records your wrongful deeds is to this side.